In extreme cases, noise complaints from neighbors can escalate to a small claims court hearing and a penalty of up to $7,500. Even on the lighter side, it can lead to constant arguing with your spouse or kids if everyone has different volumes they can tolerate. The problem is that having the volume turned up to the right level makes experiencing movies, shows, and games so much better. Part of the excitement of going to any large event (be it a sports game or a concert) is the noise and energy of the crowd. Imagine how dull the atmosphere would be if every rock concert or football game had to be muted to the same soft volume as a golf tournament? That’s where sound proof insulation becomes an incredibly valuable investment. You create a space in your home where anyone can make noise and not have to worry about disturbing others. But there’s slightly more to soundproofing than just stuffing the walls, in fact, sometimes a gap of air is even more effective. This article covers everything you need to know from the reasons your home is loud to the best ways to fix it. Almost everyone is aware that sound travels as waves and creates distinct sounds by the vibrations emitted. However, what many people don’t know is that solid physical objects don’t block sound perfectly and that the objects actually vibrate themselves to pass sound on. The goal is to stop vibrations passing through the room as much as possible. To do this, you want to consider noise levels in terms of decibels and those are perceived in a way that isn’t too well known. Specifically, they do not follow a normal perceptive scale where 80 decibels (dB) is twice as loud as 40dB, instead, it doubles every 10dB. This is very important to consider because it means dropping the decibels in a room by just 10dB equates to halving the noise volume. So at just a 20dB reduction in your home theater, you could technically play a movie at the volume of a live concert and to people outside it will just sound like someone playing music at a normal volume. Of course, bear in mind that continued noise around 88dB can damage your hearing after just four hours making loud movie marathons a potential risk. Equally, the louder you go the less time it takes for damage to occur. At 100dB, the damage begins after just fifteen minutes. Most American homes are simply thin drywall attached by nails or screws to two by four studs (those long thin planks of wood spaced out evenly around the wall. While some homes may have a thicker outer wall, to save costs the inside walls are usually a lot more hollow. If you go around your house and knock on the walls you’ll likely hear a hollow sound rather than a dull one if you were hitting solid concrete or brick. As mentioned, sound vibrates physical objects which in turn emit the sound into the next room. So after the sound reaches the drywall, it actually passes through the connecting materials between a room or ceiling. Because the sound travels through the physical materials, putting fiberglass in the gaps between will not actually make much difference to the overall noise reduction. Also, placing a few panels around the room will not help either as they are only used for reducing echo not blocking out the noise. An easy example is the acoustics in your bathroom compared to a small carpeted area of your home. In the bathroom, the sound waves bounce around the room creating the echo effect that sounds great for singing but would be awful if watching a film. Reducing echo helps focus the sound to make it sound crisper and more direct but the actual decibel volume would still be the same and heard all around the home. The best way to reduce noise entirely is with a three-pronged approach based on the principles we’ve now established. The more things blocking and covering the walls the more there is to absorb the vibrations and reduce what gets out. This is the simplest and weakest option that tends to only lead to a 3-5dB reduction. But it helps, because just 5 more dB and you’ve cut the volume in half. This involves using materials to reduce vibrations in the walls and ceilings themselves such as specially made drywall that absorbs sound and vibration or a vinyl barrier that goes between the drywall and the studs. These materials are usually very heavy and ‘floppy’ meaning they absorb vibrations rather than vibrating themselves. It works the same way a piece of string which is pulled tight is able to give a soft twang, but when floppy doesn’t make a noise. Depending on what materials you buy and the layers you add, the decibels in your home theater can be reduced from anywhere between 16 and 33dB. This, however, will not stop the bass permeating through the house, for that, there’s one more thing you can do. This third option is more expensive but it significantly reduces the volume of your home theater as well as doing an excellent job of blocking out the bass too. This process essentially involves creating two walls which are separate from each other with their own sets of studs. This way even if the vibrations make it through one wall they have to pass through a gap of air (which is a poor transmitter) and then the second wall before reaching another room. This combined with damping and extra mass can see a dB reduction as high as 40. 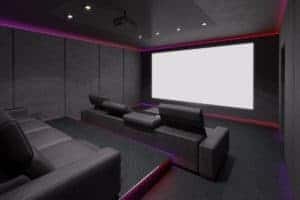 The extra wall naturally will reduce the room’s size but it’s a guaranteed way to have a home theater capable of giving an amazing experience. Of course, if there’s any gaps, windows, or doors in the space that air can pass through then the noise will very easily escape through there. That’s why the final piece needed to seal off any noise would be a soundproof door. If this is beyond your budget, then ensuring it’s securely sealed is the best way to mitigate this issue. A home theater is a great place to unwind and enjoy the latest entertainment in comfort. Having proper sound proof insulation ensures that whoever is in there have the volume up without worrying about disturbing others in the house or your neighbors. If you’re looking to make some upgrades to your home, consider adding in the latest smart features or for more advice check out our other articles. PrevPreviousWhat is a Lutron Light Control System and How Does it Work?